This moonshine distiller is our 13-gallon milk can still boiler and our 3" stainless steel dual purpose still tower combined together to save you money and create one incredible moonshine still that is a work of art. Since it is a dual purpose stainless steel still, it can be run as a reflux still (allowing you to create a very high purity moonshine) or you can also run it as a traditional pot still (by running water through only the condenser). If you are a serious moonshine distiller (or want to become a serious moonshine distiller) who is looking to buy a still that can do anything, this is just what you need! 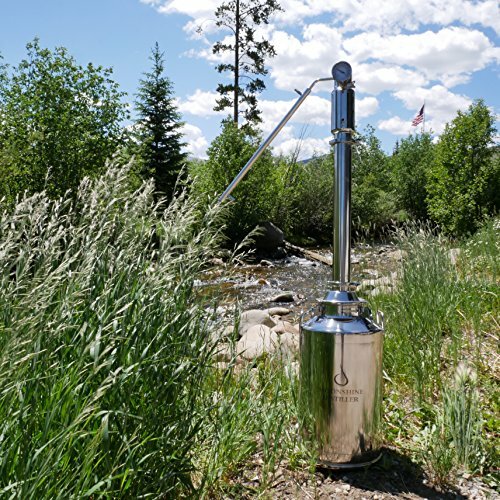 Additionally, if you are looking to distil moonshine in a truly authentic way, this moonshine distiller can be heated over an open fire (or propane burner). Granted, you will need to purchase some wooded property with access to a creek (sold separately) and you can use a gravity system to feed in creek water for the condenser. There is nothing quite like sitting by the creek with the scent of wood smoke in your nose, and the taste of fresh moonshine on your lips. Of course, you should only do this if you have the appropriate permitting and wish to enjoy your stainless steel moonshine still in the most authentic way! Buy as a complete set to save! If you have any questions about this product by Moonshine Distiller, contact us by completing and submitting the form below. If you are looking for a specif part number, please include it with your message.